LAWRENCE, Kan. – A career-high 20 points from sophomore guard Marcus Garrett along with a 21-point effort from senior guard Lagerald Vick helped the No. 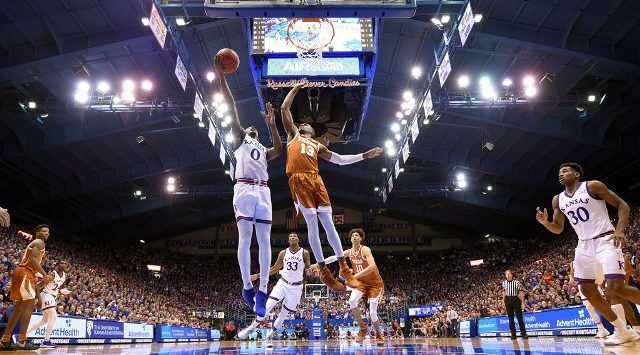 7/8 Kansas Jayhawks hold off an upset-minded Texas Longhorns squad, 80-78, Monday night inside Allen Fieldhouse. Redshirt-junior Dedric Lawson added 13 of his 17 points in the second-half as the Jayhawks claimed their 31st-consecutive ESPN Big Monday win in Lawrence. The win moved Kansas to 15-2 on the year and 4-1 in Big 12 play, while Texas dropped its third-straight, falling to 10-7 in 2018-19 and 2-3 in the league. The Jayhawks came out of the gates on a sprint, hitting their first three shots of the night, two of which were from beyond the 3-point arc, to build an early 8-0 lead. After a quick timeout to stop KU’s quick start, the Longhorns rebounded and quickly erase the early deficit and pulling within 10-7 before the 16:00 mark of the opening frame. Garrett took control on the offensive end, scoring 15 of KU’s next 17 points to push the KU lead to 27-20 nine minutes into the game. But Texas, who entered the game averaging just over eight 3-pointers per game, seemingly couldn’t miss from deep over the first 20 minutes. The visitors connected on eight triples in the first half, helping them take a two-point lead, 40-38, into the halftime locker room. Kansas came out after the restart and gave the Longhorns a dose of their own medicine. KU’s first four field goals of the second half all came from beyond the 3-point arc, with Vick hitting back-to-back triples to put his team up, 51-44, just over four minutes into the second half. The Jayhawks then took play inside with Devon Dotson, David McCormack and Garrett each converting on jumpers in the paint on three-straight KU possessions to see the KU lead swell to double figures at 57-47 with just under 12 minutes remaining in regulation. KU held UT at arm’s length for the next seven minutes, but the Longhorn shooters caught fire once again as the Longhorns fought their way back into the game. Kerwin Roach II connected on his third triple of the night before Jase Febres buried three-straight from 3-point land to tie the game at 73-73 with 2:26 to play. Dedric Lawson responded with a pair of free throws on KU’s next possession before Vick knocked down his fifth 3-pointer of the game on the Jayhawks’ next trip down the floor, pushing his team’s lead to 78-73 with 1:15 remaining. A free throw each from Lawson and Garrett on KU’s next two possession was just enough to hold off the valiant Longhorn comeback and close out the 80-78 win. Vick led Kansas in scoring for the sixth time this season with his 21 points, which included a 5-of-8 clip from 3-point range. Garrett’s 20 points bettered his previous career high by seven points as he tallied an efficient 8-of-11 shooting night from the field. Lawson tallied 17 points, 13 of which came in the second half, to go along with eight rebounds. Dotson scored in double figures for the 11th time this season and added five assists and five rebounds in a team-high 36 minutes.